This minimal-mathematics minimal-theory text emphasizes test and measurement hardware and practice. Based in part upon Tustin’s lecture notes, it includes new material on digital techniques for spectrum analysis and for digital control of shakers for random, sine and shock testing. The principal focus is on random vibration and MIL-STD-810. The author shows the need for measurements and describes the most-used instruments for quantizing displacement, velocity, acceleration and force. He discusses instrument selection, usage and calibration. Most effective readouts, including spectrum analysis, are considered. He clarifies such electronic terminology as deciBels and spectral density (g2/Hz). To provide perspective, he briefly discusses relatively obsolete sinusoidal measurements and testing, also such peripheral subjects as torsional vibration, seismic simulation, acoustic (intense noise) as well as shock measurement and testing. The audience for this text includes vibration and shock test engineers and technicians, as well as designers of military and commercial electronic and other hardware that must survive rigorous tests and then later function reliably aboard aircraft, land and sea vehicles as well as in the office environment. Courses and text are needed because this preparation has rarely been offered by universities to their engineering undergraduates. The text is also intended for participants in Equipment Reliability Institute’s open and onsite courses. Many participants are environmental engineering specialists (needed per Military Standard 810); test engineers and technicians who quantize in-service dynamic environments, later to develop and conduct random vibration tests; quality and reliability specialists, facilities engineers and product designers who interface with environmental testing laboratories; quality control and manufacturing personnel involved with 100% production stress screening of electronics; protective packaging designers who develop appropriate random vibration and shock tests; nuclear power engineers who conduct seismic simulation; plant maintenance personnel who monitor and analyze rotating machinery vibration. Organizations wishing to conduct their own training classes, or whose engineering libraries need this text, may also purchase it by choosing your payment preference below. Quantity discounts are available. Please contact us. Equipment Reliability Institute (ERI) still has a few copies of Wayne Tustin’s 2005 minimal-mathematics, minimal-theory hardbound text “Random Vibration & Shock Testing, Measurement, Analysis & Calibration” for sale. This 4-color 444 printed pages book also includes a CD-ROM with video clips and animations. This book is also used in ERI short courses in the USA and abroad, dealing with those topics. Courses also deal with HALT, ESS and HASS, as well as with vibration and shock measurements, analysis and calibration. From the “wet behind the ears” to the “well beyond his years”, Tustin’s book is a great resource and learning tool for anyone involved, or planning to be involved, with dynamics testing of any kind. Thanks again for the quick response and for an excellent text. The book has clarified the SRS issue and some other small questions I had with clear analogies and examples. 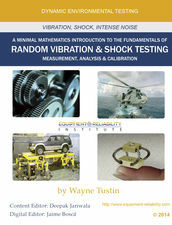 I wanted to tell you what a pleasure it has been reading your book Random Vibration and Shock Testing. I finally convinced my advisor to purchase the book after reading your previous book, Random Vibration in perspective. Having a Materials Science background, I had had slow progress in coming up with vibration testing. Thanks to your book, I am able to understand sinusoidal and random vibration testing. You have taught me the basics and I have come up with recommended tests for gunfire, jet aircraft, helicopter and propeller aircraft based on MIL-STD-810F. Without your book it wouldn’t have been possible for me to fully grasp the MIL standard. Thank you, Martin. I have recently purchased your book, “Random Vibration and Shock Testing”, and so far it is one of the best things I have ever done to invest in myself. I have been working with vibration testing for 17 years. This book gives me all the theory I have been missing in an easy to use format. In other words, I love it! Very interesting, specifically understanding differences between European and USA approaches.